Do you like DRM-free comics? 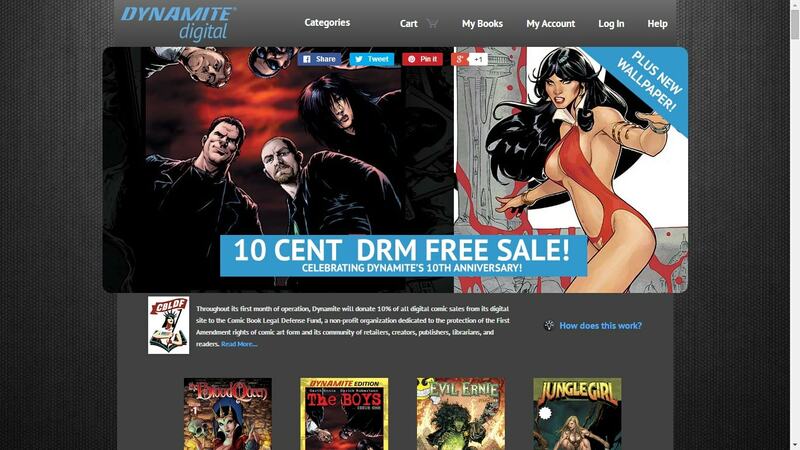 Then I have some good news for you: Dynamite Entertainment's DRM-free comic book store launched today. Readers can now buy any title from the catalog of this independent publisher and transfer the file to any compatible app or ereader. Launching initially with comics available in PDF, the store will sell comics in Epub, CBZ, and CBR formats, and will deliver the comics to your Dropbox account (that sounds strange to me too). Dynamite isn't the first comics publisher to go DRM-free, but it has long been a supporter of DRM-free comics. They've participated in Hundle Bundle offerings, and they were one of the names mentioned when Comixology announced their DRM-free option last month. According to Dynamite CEO and Publisher Nick Barrucci, "Expanding into DRM-free content, made available directly to consumers from our website, is simply giving the consumers the option for what they want and how they want it, and continues to reach out to a non-traditional comic-reading audience." Dynamite is kicking off the launch with a month-long sale. A rotating selection of their comics will be offered for 10 cents each, simultaneously promoting the new store and celebrating Dynamite's 10th anniversary. Following today’s launch, Dynamite plans to release their DRM-free comics on a weekly basis, every Wednesday. New offerings will be announced via the company’s Facebook, Twitter, and website as they are made available for download. There will be a slow, focused roll-out over time that will grow the available titles to reflect the vast majority of Dynamite’s library. IIRC, Image Comics’ DRM-free store does the same feature, offer to copy your purchases to your Dropbox account. As for why: easier to download it from your account to various devices (your computer, tablet, phone) from one spot, without of course the DRM-drawbacks of Comixology’s model. I recently picked up a comic bundle from Humble Bundle and I found that comics are just not laid out properly to be read on smaller devices. Everything is way to small on my 8″ Tablet. Until the format for comics changes so that it’s easily read on e-readers and tables I’m staying away from those. Then sure they’re going to have a backup option in Comixology. I’ve already been able to download my Image acquired books as CBZs, now I’ll expect for my The Boys collection.